On June 5, I was feeling pretty good about this Blue Jays season. I took a screen cap of the AL East standings, showing us in first place with a 4.5 game lead over the Orioles, and wrote "So Far, So Good #BlueJays". The very next day, our postseason probability peaked at a whopping 86%. Yesterday, exactly one month later, our postseason probability fell to 48%. Following today's loss and Baltimore's win, that number will fall yet again. We've lost 13 of our last 19 ballgames. My buddy Elvis will tell you it's my fault, but it's not. I don't have that kind of power. This one ain't on me. No Mike it's my fault as I was at the St. Louis game June 7th with my uncle & they lost 2-0 & that started the downfall. At that time they were 6.5 games ahead in 1st place & haven't won a series since. Surprisingly it's been their offense especially in the last month which has been dreadful. This lineup should produce 10 runs a game. They had a combined 4 runs against the A's in 4 games this weekend with exactly 1 home run.......by Steve Tolleson. Can Johnny Damon play 1B? He might be a good fit until Edwin comes back. So your saying The Jays should go after Texas Rangers 3rd basemen Adrian Beltre instead? 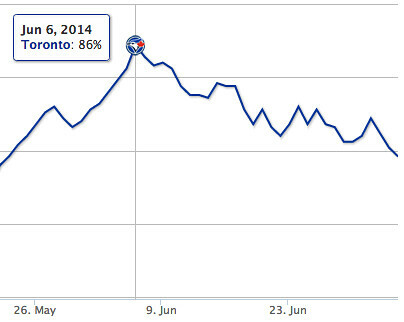 As I suspected, the Jays postseason probability plummeted to 42% yesterday. I'm standing by the prediction I made in May. There have been so many games that they've won this year that they would have lost last season. This team is different.